So it's been over 2 years since I started this journey and this blog and it's been a while since I posted pictures so I figured it was time. I also wanted to apologize to those that emailed me and I didn't get back to you until recently. I feel HORRIBLE about that but for some reason my email was not forwarding like it was suppose to so I just received a bunch today that I replied to, I'm really sorry. I'm actually going to post my business email below for people to email me that way I am sure to get your questions and messages and I can reply in a timely manner. Again, I'm SO sorry about that. I don't check this page as often as I used to, I'm sorry about that too, but I try to check it every other month or so to answer questions and such. Okay on to the update, far as my face routine, not much has changed, I still use the argan and tea tree oil mixture almost daily. I don't really "wash" my face, I use those makeup remover clothes sometimes or tea tree oil face soap if needed but most of the time just some water and my oils. 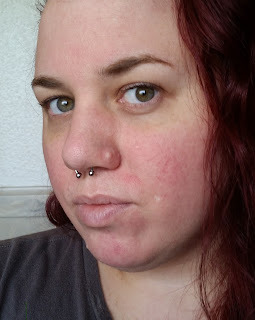 I don't wear a lot of makeup so I can get away with not using a lot of chemicals to clean my face as I try to put as few chemicals on my skin as possible. I haven't had a pustule or a pimple in a long time now and if I do get a pimple it's usually hormonal related. I now put my oils in a little bottle with a roller on top and I'm able to roll it on my face but other than that it's the same. 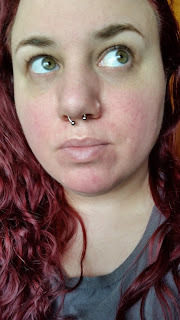 I'm not sure if I ever mentioned this (pretty sure I have) but about a year before starting this journey and this blog one of the many things I had tried was laser treatments. 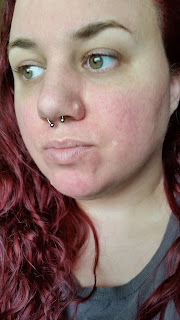 While they did nothing to help the p&p and dry skin it did get rid of some of the redness that was due to burst capillaries. 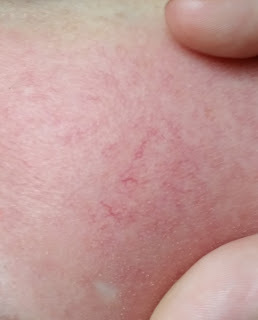 When I had it done the dermatologist told me that I would have to have it done every few years and I'm getting close to that time again as I can see the broken capillaries. Unfortunately laser treatments are expensive so that won't be happening for a long time unless I find a fairy godmother wishing to bestow laser treatments to me lol. 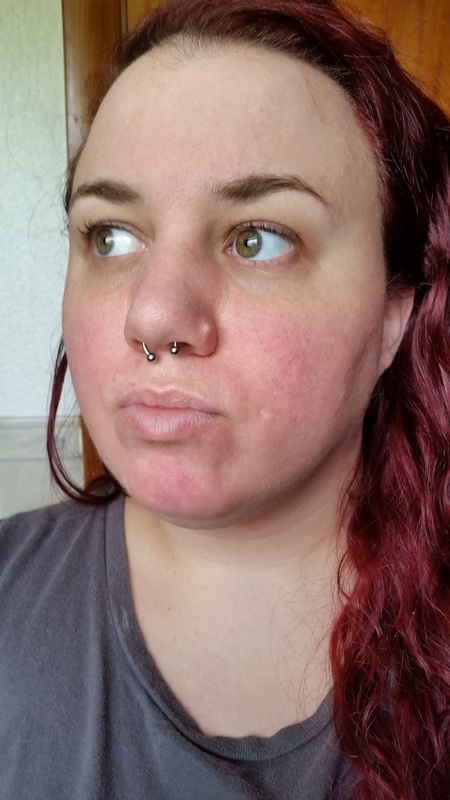 As you can see in the pictures my face is pink and it always will be but I can live with that, light makeup covers it easily. If I get warm face flushes pretty easily and can become pretty red if I'm really hot which is awesome since I live in the hot and humid city of New Orleans. I think a lot of it just has to do with the fact that I have very fair skin and my capillaries are close to the surface. It is what it is. My face is million times better than it once was. It's almost crazy to look back at how bad it was now that I'm here. 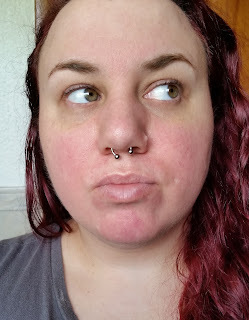 I battled with my face for about 10 years and if you would have told me I would ever be at a place with a clear, but slightly pink complexion without spending hundreds of dollars a month I would have laughed but here I am. Sorry, I look kinda rough in these and my septum ring is crooked but I just woke up and hadn't consumed any caffeine yet, or brushed my hair, but all of you have seen me look worse! Someone asked me why I don't really look at the camera, it's because I have an aversion to having my picture taken.I absolutely hate it and I'm much more comfortable behind the lens than in front of it so I just try not to look at it and pretend it's not there while sucking it up and taking a picture for thousands of strangers to see. 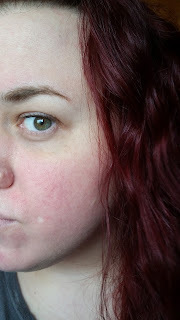 I know, how I ended up making a blog full of pictures of my naked face I have no idea. One day I'm going to have to post a picture of me with makeup and stuff, I swear, I can look cute. And for some reason just now I realized I didn't take any of the other side of my face. Sorry, it looks the same, I promise, I'm not going back in there and taking more pictures of myself today. 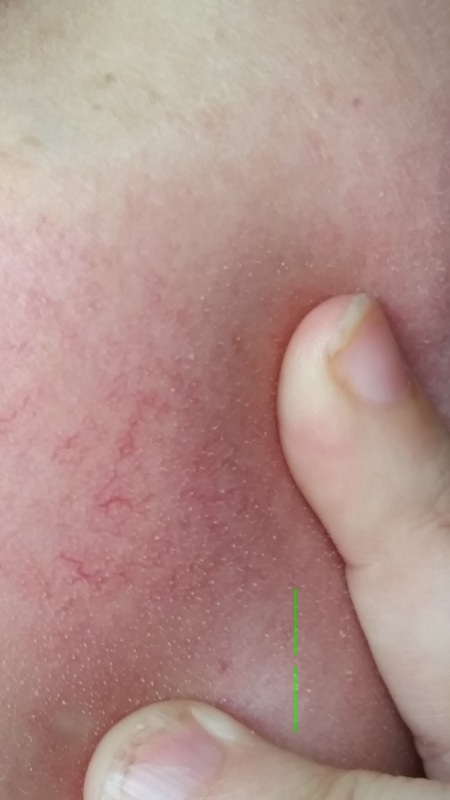 These are the busted capillaries, from a distance they just make my skin look pink but up close you can see the individual burst capillaries. My niece actually asked me why my face was cracked -_- kids, ya gotta love em! HI Bon Ami. Are you still on this blog? I find it very informative and had a question for you. Still here, just not as often. I just did another update with pictures! Hi! Thank you so much for your amazing blog and all the detailed information and photos of yourself. I can’t express how helpful this has been to me and how much I appreciate it!! I am superimpressed with your recovery and think you look really amazing! Similar to prob most people on here with Rosacea, I’ve done the rounds and tried all the meds, done loads of internet research, experimented on myself etc. etc. with no improvements. I have just started with the TTO (mixing with Jojoba currently but thinking to move to Argan oil) after reading your blog. My question is: I can see from the very early posts that you were also experimenting with a bunch of other things (eg. borax) before sticking to the TTO regime. I was wondering, is your sense that the TTO (with the Argan oil) has been the main factor in your skin healing or do you think it was a combination of other factors that played into it as well? I was wondering for example if you made any changes in your diet around the same time (I saw you mentioned eating a mainly plant based diet and reducing coke?) How long did it take in your case until your skin was noticeably better - was it mainly the first 5 weeks that were rough after starting on the TTO and then all better after that? 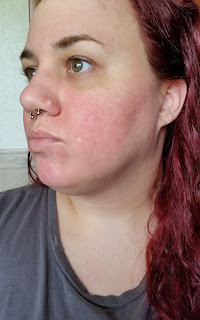 I didn't do the other treatments long enough to see any kind of effect and if anything some were irritating to my sensitive skin. I 100% know that it was the TTO.